AIFUSI Watering Can Plastic Plant Spray Kettle Garden Accessory Sprayers 10L Large Green Sprinkle Pot for Plants Outdoor Gardens by AIFUSI at Outlet Shopping Guru. Hurry! Limited time offer. Offer valid only while supplies last. Choose AIFUSI gardening kettle open your gardening world! Item Dimensions:Width 19.68 in (x) Depth 5.5 in (x) Height 14.17 in,holds 2.6 gallons. Choose AIFUSI gardening kettle open your gardening world! Item Dimensions:Width 19.68 in (x) Depth 5.5 in (x) Height 14.17 in,holds 2.6 gallons. ★Exquisite Bottle: User-friendly design, handsome in appearance, stylish and innovative, large 10L capacity. ★Handle: User-friendly design, the handle, when the water can be selected according to needs, easy to use. .
★Outlet:Uniform effluent, so that plants more moisture..
★Water Injection Capacity: Bottle-specific capacity scale, when the water can be selected according to the scale of water, convenient and quick. Perfect for watering plant. . Tip:Not recommended spraying pesticides, disinfectant and other chemical products.Pesticides, fertilizers and other substances containing corrosion, will cause damage to parts, such acts caused by the loss, please be responsible.Water can not exceed the maximum water level, the kettle needs space pressure. Store in a cool place to avoid exposure.In the process of using the kettle placed in a cool place to avoid exposure to the sun and wind, no matter how good the product can not afford to toss. Now click to add to the cart! PREMIUM QUALITY - It made of ppc resin material ,with imported material mon-toxic and odorless made high quality plastic for increased durability. CONVIENT WATERING - The bent nose makes watering your plants much easier.it is not easy to leak and the reasonable pot handle design,grip feels comfortable, reduce hand fatigue, allow you to get right to the base of the stem without getting the plant itself wet. HUMANIZATION DESIGN - 2-In-1 adjustable water spout rotates to offer a light shower or heavy stream depending on the needs of the plant. 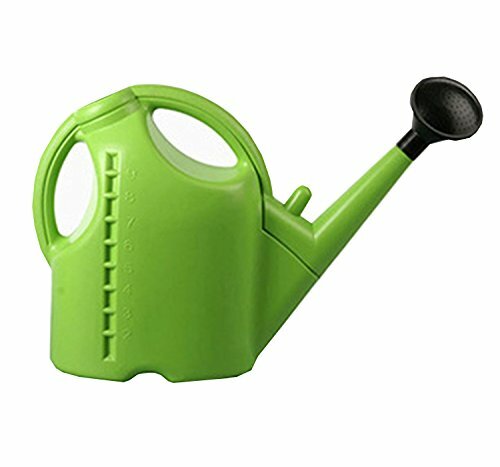 Spout can be removed for cleaning.Unique design of watering pot suit for all kinds of scenes, it is also a nice gift for family and friends, they will love this useful watering can! MESSUREMENTS - It surface of the bottle has scale marks to allow you full control over how much water is released and infused, meet the needs of different plants. EASY TO USE - Dense nozzle orifice effluent effect Is perfect and don't worry of nozzle ologging,the green gardening sprinkler color is more suitable for watering home decor plants.